Friedrich Wilhelm Heinrich Alexander von Humboldt, more simply called Alexander von Humboldt, was a notable Prussian geographer, explorer, and naturalist. He is widely recognized for his works on botanical geography which laid the foundation for biogeography. His last name is something many animal lovers may already be familiar with, as the Humboldt squid that lives in the Humboldt Current of South America, is named after him. This naturalist and eager explorer was born on September 14, 1769, in Berlin, Germany. 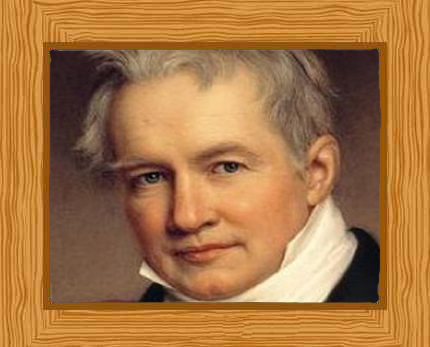 Alexander Georg von Humboldt, his father, was an army officer who died when he was only 9 years old. Alexander and his older brother, Wilhelm, were then raised by their mother, Maria Elisabeth Colomb. Alexander’s family belonged to a prominent Pomeranian family, and so they were able to afford private tutors to provide the boys a good education in mathematics, languages and classic. Less typically the brothers were also taught political history and economics. As a child, Alexander had a hobby of collecting and labeling different plants, insects, and shells. He thus earned the affectionate nickname “little apothecary”. Intending on a political career, Humboldt took courses in finance for six months at the University of Frankfurt in 1787. Then, for a year he studied at Göttingen University. During this time Humboldt developed an interest in botany, geology and minerology. He met Georg Forster who had accompanied Captain Cook on his second voyage of discovery. Foster had a strong influence on Humboldt and they travelled across Europe and to England together. To further his interest in minerology and geology, Humboldt enrolled in the School of Mines in Freiberg, Saxony in 1790. A typical day would be spent underground in the mines in the morning, at classes in the afternoon and in the evening walking the surrounding countryside searching for interesting plants. Humboldt worked as a government mines inspector in Franconia, Prussia from 1792 to 1797. During this time, He invented a safety lamp and founded a technical school for aspiring miners. His mother died when he was 27, in 1796 and this left him a good inheritance which would pay for his future explorations. A year after his mother’s death, he left government service and planned his travels with the botanist Aime Bonpland. Humboldt had always wanted to travel and explore and he seized his chance. Together with Bonpland, they traveled to Madrid to obtain the special permission needed at that time to explore South America. On the 5th of June 1799 Bonpland and Humboldt finally set sail aboard the ship Pizarro. They had a 6-day stop at Tenerife, where they explored the Teide volcano. On the 16th of July, they landed at Cumana, Venezuela. During their stay in South America, Bonpland and Humboldt studied the topography, flora, and fauna of the continent. Within a year, Humboldt had mapped more than 1,700 miles of the Orinoco River. Bonpland and Humboldt continued their explorations of South America and they took a trip to the Andes, climbing to the top of Mt. Chimborazo, located in today’s modern Ecuador. At that time, this summit was believed to be the highest peak in the world. They were not able to make it to the very top, but ascended to over 18,000 feet. The exploration then continued to Lima, Peru, where Humboldt observed the transit of the planet Mercury (where Mercury appears as a tiny black dot moving across the disk of the Sun). He also noticed the fertilizing properties of guano. While on South America’s west coast, Humboldt discovered and measured the Peruvian Current. This current is also now known as the Humboldt Current. Other notable experiences from his explorations in South America included being able to see an amazing meteor shower the “Leonids” on the nights of November 11 and 12 shortly after their arrival. Humboldt was the first person to connect altitude sickness to a lack of oxygen, due to his many mountain climbs and his own personnel experiences at high altitudes. Bonpland and Humboldt captured and dissected electric eels from which they received a number of electric shocks themselves. After a great amount of exploration in South America, Bonpland and Humboldt visited Washington, D.C. They stayed for three weeks during which Humboldt was able to have several meetings with President Thomas Jefferson. In 1804, Humboldt travelled to Paris and he spent his time writing 30 volumes about his different field studies. He stayed in Paris for 23 years, meeting and discussing with other bright minds of his age. Eventually the fortune from his mother’s inheritance ran out. Humboldt then found a stable source of income and became one of the advisors of Prussia’s King. He was invited to Russia in 1829 and on his extensive journey found diamonds in the gold mines of the Urals and collected data for an isothermal world map. In 1827, Humboldt visited in Berlin, giving public lectures. These lectures became so popular that he decided to write all his research in a work which he called the “Kosmos”. The first volume was published in 1845 when he was 76 years old. Five volumes in total were published, the final volume posthumously. Humboldt suffered a minor stroke on February 24, 1857. Two years later, his health began to decline and at the age of 89, he died on May 6, 1859. To this day, he is known as one of the most significant contributors to the earth sciences.